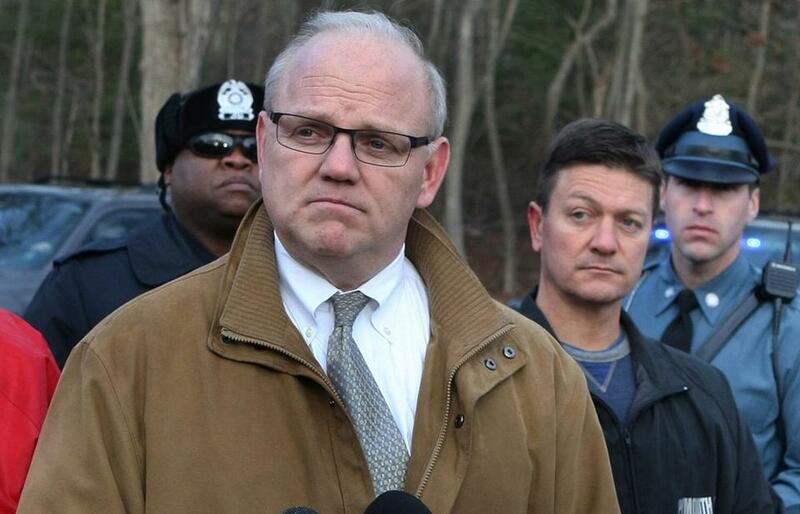 Plymouth County District Attorney Timothy J. Cruz spoke to the media in December 2014. To his right stood Frank J. Middleton Jr.
Plymouth District Attorney Timothy J. Cruz waited six months to act on an allegation that his top prosecutor groped a female subordinate during a 2014 conference at the Seaport Hotel, according to documents filed in a federal lawsuit. Even then, the documents say, Cruz admitted he did not read the report of an outside investigator he hired to review the matter, who found that a second employee had made a similar allegation against the same prosecutor. By the time Cruz obtained the resignation of the prosecutor, Assistant District Attorney Frank J. Middleton Jr. , in April 2015, nearly a year had passed since Cruz learned of the first sexual misconduct allegation. Cruz, the highest ranking law enforcement officer in Plymouth County, said in sworn testimony that his secretary told him about the first episode a week or two after the event at which it allegedly occurred — a conference sponsored by the Massachusetts District Attorneys Association. A female employee had complained to her supervisors that Cruz’s chief deputy at the time, Middleton, had grabbed her backside, Cruz’s secretary told him. Cruz took no immediate action, but almost a year later — around the time the second alleged incident came to his attention — Cruz asked Middleton to step down, according to the documents. This week, Cruz declined to comment, saying that the judge in the lawsuit, a wrongful termination claim filed by one of Cruz’s former prosecutors, prohibits him from speaking publicly about the matter. Middleton also declined to comment. The guidelines were put in place to encourage employers to eradicate harassing behavior as quickly as possible, with the understanding that some victims may not want to pursue a case for fear of being branded as troublemakers or losing their jobs. In the court documents, Cruz said he attended the conference during which the alleged incidents occurred and that, at one point, he could see that Middleton was intoxicated. But Cruz could not explain why he waited six months before asking Middleton, his right-hand man, about the alleged sexual misconduct. Cruz testified that, when he asked Middleton about the first allegation, Middleton took a couple of days before returning to his office to deny it. At about that time, Cruz hired an outside attorney, Walter Sullivan, to look into the alleged incident and the investigator learned of the second allegation against Cruz’s top prosecutor. Sullivan apparently interviewed both alleged victims. Cruz said Sullivan told him about the second allegation in a telephone call in March of 2015, but acknowledged that he never read Sullivan’s written review. Sexual assault and sexual harassment in the workplace are prohibited by law and by Cruz’s own office regulations. “It is illegal and against the policies of this office for any employee to sexually harass another employee,” according to the regulations, a copy of which was filed in connection with the federal lawsuit. Whether Middleton’s resignation was directly related to the misconduct allegations is unclear. And in his pretrial testimony, Cruz said Middleton was never disciplined for sexual misconduct. The sexual misconduct allegations surfaced publicly as part of a federal wrongful termination lawsuit filed by former Plymouth County prosecutor John E. Bradley Jr., against Cruz, Middleton, and another top manager in the office who is still working for Cruz. Bradley, now a homicide prosecutor in Worcester County, says he was wrongly fired in 2012 for refusing to contribute to Cruz’s 2010 reelection campaign, and for objecting to what he described as Cruz’s reckless use of violent offenders as confidential informants during criminal investigations. Cruz, Middleton, and the third official, Michael Horan, have denied Bradley’s accusations and have asked Federal District Judge Indira Talwani to dismiss the case. Middleton’s alleged sexual misconduct became an issue in the lawsuit when Bradley’s lawyers argued that he was fired even though he had not violated any office policy. By contrast, they said, Cruz allowed Middleton to continue working for nearly a year after he allegedly violated state law and Cruz’s own regulations prohibiting sexual misconduct. The records revealing the sexual misconduct allegations were filed in May and have been available to the public via the US District Court’s website ever since. But earlier this week, after the Globe notified Cruz and Middleton that it had reviewed the documents, Talwani ordered them sealed. Attorneys for both Cruz and Bradley have urged the Globe not to publish information from the sealed documents, but Globe editors and lawyers determined that the news organization obtained the records legally. They also concluded that sexual misconduct allegations — and the way they are handled — against senior government officials are of compelling public interest. “We have a responsibility to hold public officials accountable for their actions or, as the case may be, their inaction,” said Globe editor Brian McGrory. The sexual misconduct allegations are part of a history of turmoil in Cruz’s office in which he has battled with Bradley and other prosecutors over a variety of issues. Cruz charges that, after Bradley was fired for being disrespectful, Bradley entered Cruz’s office without permission and copied memos he believed were damaging to him. “There was reason to believe that if I did file suit, that these documents would be useful to me,” Bradley explained. globe.com. Follow him on Twitter @MikeRezendes.